So my business partner who jumped onto Google Apps and ditched Outlook in favor for browser based Gmail interface introduced me to Stylish extension for Chrome. 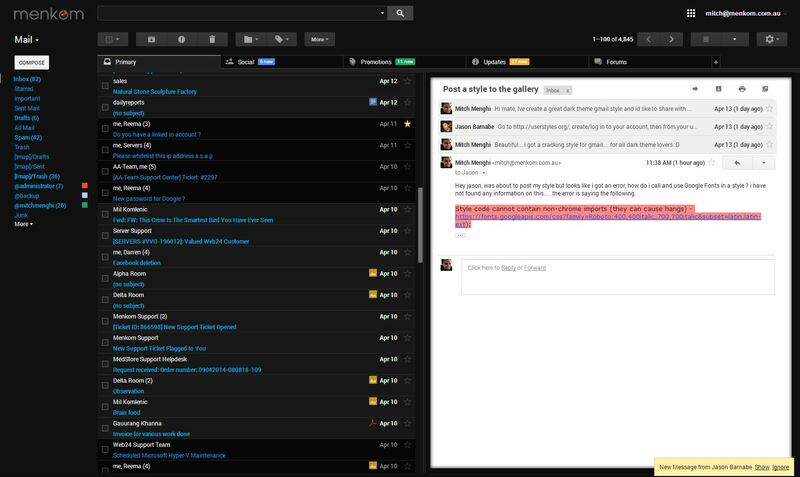 Till now i have held back from making the switch because bluntly the themes provided by Gmail sux real hard, the only bearable one is Dark theme. Stylish allows you to tweak existing css of different websites, eg Gmail. I have spent a good amount of time tweaking the Gmail interface (on what started to be a hobby) to actually loving it and now ditching Thunderbird and making the switch myself. I found it more appropriate to call it what i did in the end because i noticed that my Samsung Galaxy S4 OS named KitKat was almost identical. If your into Dark style themes with highlights and contrasts then im sure you will love this theme.